Recent years have witnessed growing availability of human behavioral data, which provides us unprecedented opportunities to gain more in depth understanding of users in both the physical world and cyber world. In this project, we aim to develop computational models for learning individual’s lifestyle specification and lifestyle spectrum of a community from heterogeneous networks. LifeSpec is also a data platform enabling our various research projects in mobile user understanding. An incisive understanding of human lifestyles is not only essential to many scientific disciplines, but also has a profound business impact for targeted marketing – if you know more about your customers’ lifestyles, you can more quickly reach your targets. However, existing lifestyle studies are mainly based on questionnaires and surveys. Instead, we have developed a computational way to explore urban lifestyles with massive online behavioral data of users. The availability of such data is the result of the overwhelming sensors, smart devices, and proliferating online social networks. The meetings we attend, the restaurants we go to, the movies we see, the people we meet – everything we do during a day – will eventually produce behavioral data stored somewhere in the “Cloud.” Intentionally or not, this data mirrors our daily lives, just as the digital “footprints” we leave in the online world. Such footprints reside in different networks. In order to collect comprehensive footprints of a user, the first problem we are faced with is how to identify different accounts of the same user from these networks. 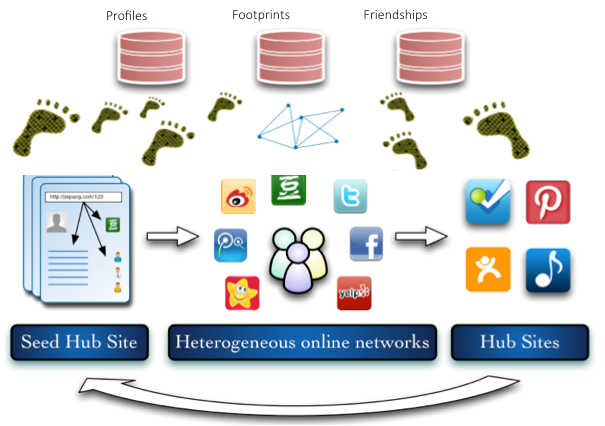 We developed the IConnect algorithm, which iteratively discovers users’ accounts on different sites as many as possible based on users implicitly and explicitly self-disclosed information reflected from their the publicly available footprints as well as their friendship relations in different social networks. As a result, we have identified users’ connected accounts on major Chinese social networks (including Weibo, Douban, Jiepang, and Dianping) using the IConnect algorithm. For a group of individuals, e.g., users in the same university or the same city, we have devised a Bayesian approach to summarize the spectrum of their lifestyles. Specifically, given millions of footprints and social links of a group of individuals, we leverage topic modeling to learn their lifestyles and lifestyle spectrum, where a “topic” is a distribution of words in a document. We establish an analogue from the lifestyle spectrum to a hierarchical topic structure as follows: Given a group of users as a corpus, we regard all the users in this group as documents, where the words in each document are an individual’s footprints. Just as a topic is described using a collection of words, a living pattern is represented by a set of frequently co-occurring footprints, so it can be considered as a latent topic in a document. Here, the lifestyle spectrum is a hierarchical topic tree in which each node is a topic, as shown in the figure below (a screenshot taken from http://mobius/lifespec). 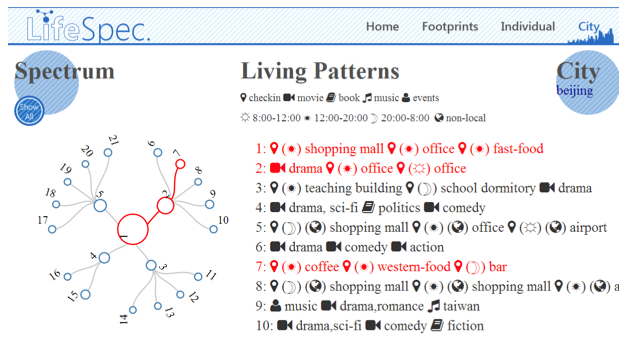 Each document can exhibit multiple topics, which are derived as a path (containing a set of nodes) from the topic tree, e.g., the red path in the figure below indicates a certain type of lifestyles of Beijing citizens. In this tree, more commonly shared living patterns are near the root and more specified living patterns are close to the leaves, e.g., we found the most commonly shared living pattern for Beijing citizens is shopping, working in the office, and eating at fast-food restaurants. In this way, we can generate lifestyle spectrums of different cities, and compare their differences. Similarly, given other public profile attributes (such as age, gender, occupation) of the users, we can obtain different groups and analyze the lifestyle spectrums of these user segments. LifeSpec  provides emerging implications for industry applications, such as targeted advertising and recommendation , and is also a data platform that can enable a series of studies in social psychology [3,4,5], marketing , demographics , computational anthropology [8, 9] etc. For example, by tracking the dynamics of the demographic data and mobility, we are able to study human mobility in a large scope, e.g., labor migration and indigenization . Nicholas Jing Yuan, Fuzheng Zhang, Defu Lian, Kai Zheng, Siyu Yu, Xing Xie, We Know How You Live: Exploring the Spectrum of Urban Lifestyles, ACM Conference on Online Social Networks (COSN), Boston, USA, Oct. 2013. 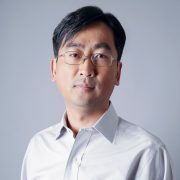 Fuzheng Zhang, Nicholas Jing Yuan, Defu Lian, and Xing Xie, Mining Novelty-Seeking Trait Across Heterogeneous Domains, 23rd International World Wide Web Conference (WWW), Seoul, Korea, Apr. 2014. Le Wu, Yin Zhu, Nicholas Jing Yuan, Enhong Chen, Xing Xie and Yong Rui. Predicting Smartphone Adoption in Social Networks, 19th Pacific-Asia Conference on Knowledge Discovery and Data Mining (PAKDD), Ho Chi Minh City, Viet Nam, May 2015. Zimo Yang, Nicholas Jing Yuan, Xing Xie, Defu Lian, Yong Rui, Tao Zhou, Indigenization of Urban Mobility, arxiv.org/abs/1405.7769. 9. The Emerging Science of Computational Anthropology, MIT Technology Review, June, 2014. 10. You Go Where You Know: Who You Are Predicts Where You Will Go In the City, Pacific Standard, Mar, 2015.